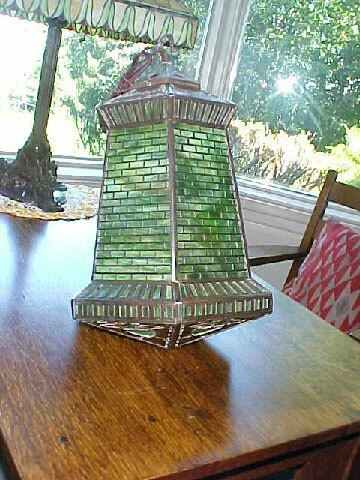 Here for your consideration is a veritable feast for the eyes of the discriminating and astute collector of period American lighting, museum and investment quality. 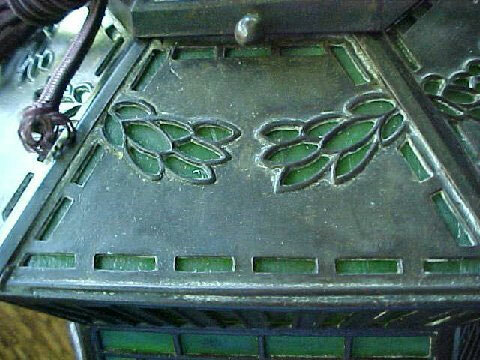 Very rare and collectible Handel Arts and Crafts hanging lantern Handel style # 5121. 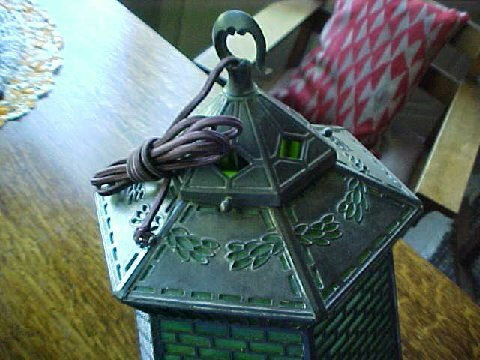 This lamp rarely comes for sale anywhere so, this is an opportunity that may not come again. measures 12" at the bottom and 10" at the top with the body being 23" and properly signed Handel. 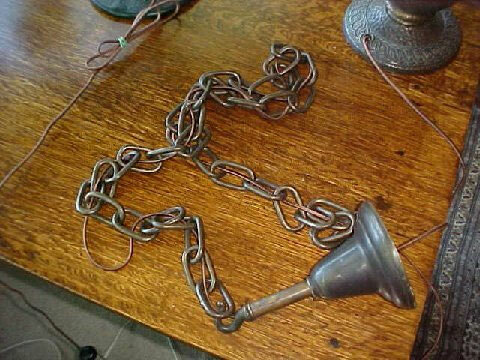 Comes with six feet of heavy brass chain which is signed Handel every few links along the way as is the ceiling hook. 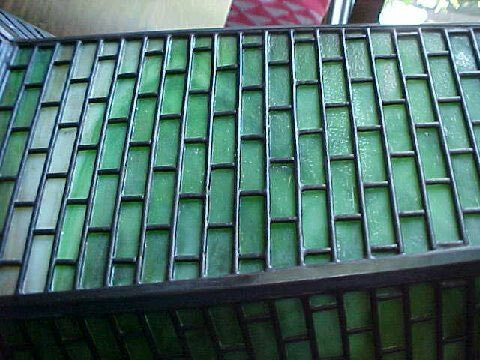 The striated glass is all original and free of chips, cracks or repairs as is the overlay. Notice the brick work overlay. 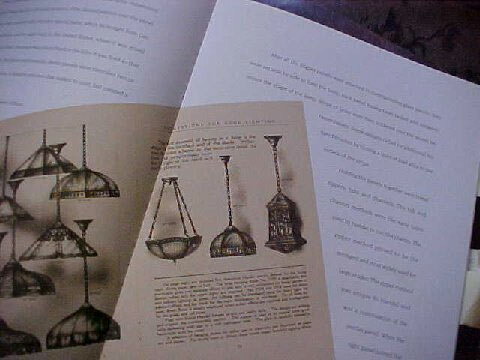 This lantern style Handel lamp is shown on page #9 of the Handel overlay book by Robert Defalco. 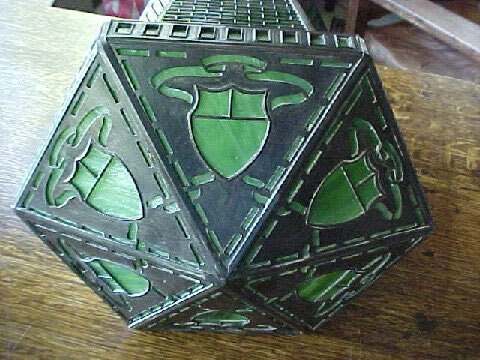 $9,500.00 plus shipping and insurance. Philip Handel joined in partnership with Adolph Eydam in 1885 to form the "Eydam and Handel Company" in Meriden, Connecticut. When this partnership dissolved in 1892, the remaining company was relocated to larger facilities and was thereafter known as "Philip J. Handel" and then as "Handel and Company". "The Handel Company" originally incorporated on June 11, 1903 with Philip J. Handel, Albert Parlow, and Antone Teich as the primary officers. Philip J. Handel married his second wife, Fannie Hirschfield Handel, in 1906, and she became company President upon Philip Handel's death in 1914. She would remarry (Fannie Handel Turner) in 1918 and managerial control of the company soon passed to William F. Handel, Philip's cousin. 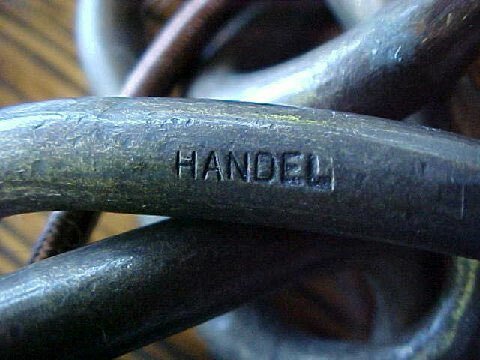 The immediate post World War I period was one of tremendous growth and profitability for The Handel Company. However, the economic slowdown of the late 1920's and resulting Great Depression had a devastating effect on company fortunes. By 1929, most production had ceased, and manufacturing ended all together in 1936.